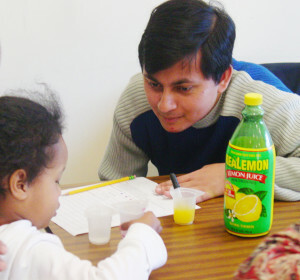 Families Learning Science Together (FLST) is a hands-on science program for children ages 5 and up and their parents or caregivers. This program is lead by Cornell Center for Materials Research and co-sponsored with the Tompkins County Public Library (TCPL) in downtown Ithaca, NY. The FLST hands-on workshops encourage children and their parents to explore how materials interact with each other. Faculty, post doctoral associates, graduate and undergraduate students from Cornell University present hands-on science modules on a variety of materials science topics. The FLST programs are aimed at children ages 5-13, though all ages are welcome. The program will be on every second Saturday of the month throughout the year. It will run from 1pm – 2pm in the BorgWarner West room of the Tompkins County Public Library. All FLST programs are free to the public, but space is limited. Please reserve your spot by contacting us by email at ccmr_outreach@cornell.edu or by phone at (607) 592-4053. Drop-ins welcome if space allows. December 9, 2017 – Unknown Powders – Families will explore how powders react when you add a chemical indicator (vinegar, baking soda solution, iodine, and pH indicator solution) to them Using their observations, they will try to figure out what two powders are in an unknown mixture. November 11, 2017 – Marvelous Magnets – Families will explore the wonders of magnets. Try to find out what things are magnetic, how do magnets behave, and how Earth is a magnet. October 14, 2017 – Chromatography – Families will explore color and the technique, known as chromatography, used to separate combinations of colors. They will use this technique to find out the different colors found in a marker and to make their own chromatography butterflies. September 9, 2017 – Nanoscale – Families will discover the Science of the small. They will find out what a nanometer is and perform different activities to observe how things behave differently when they are at this scale. June 10, 2017 – Colorful Kinetics – Families will explore the colorful world of Chemistry and chemical reactions. They will experiment with chemical reactivity by combining different food dyes with bleach. May 13, 2017 – Physics of Flight – Families will explore Bernoulli’s Principle by performing some fun demos. They will then construct a hoop and/or paper airplane and see how far they can get it to fly. March 18, 2017 – Alka-Seltzer Rockets – Families will learn about the laws of motion and how they apply to rockets. Using this information, they will design, build, and launch their own rockets using a film cannister and alka-seltzer tablets. February 11, 2017 – Heredity – Families will learn how traits are inherited from parents and why this leads to genetic variation in offspring. They will demonstrate how this works by creating their own alien(s) from a set of genetically distinct alien parents and comparing their appearances. January 14, 2017 – Electrostatics: Families will explore the phenomena and properties of slow-moving or stationary charges. They will be able to see a Van de Graaf generator in action, as well as make a static flyer and an electrophorous.